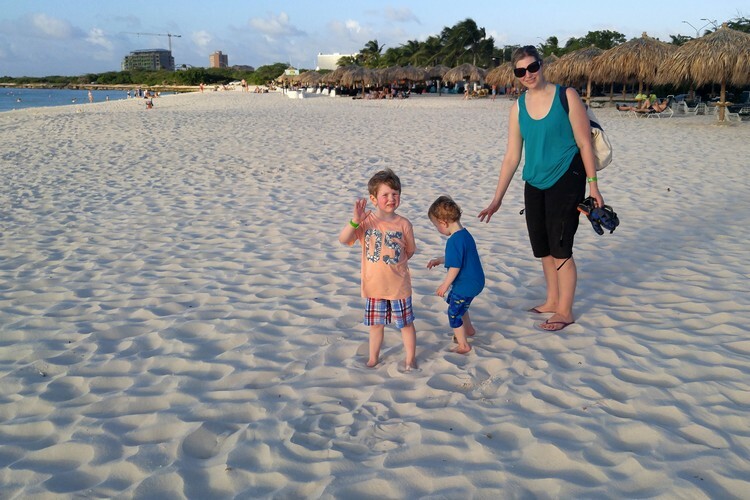 It’s been a few weeks since we returned from our first trip to the island nation of Aruba. 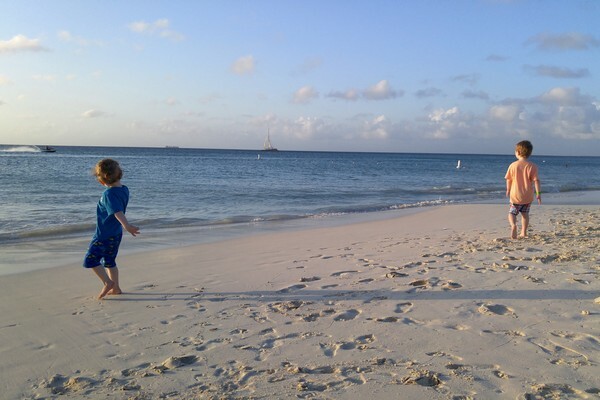 Now that we’ve had time to reflect, we’d like to share a few things we learned from this family trip to the Caribbean. Traveling south in the winter has become somewhat of an annual tradition for us, for a few reasons. First, and most obvious, Vancouver winters are cold and rainy and we crave a little sunshine come February. Second, we like to celebrate our wedding anniversary in the same climate where we were married (we married in Mexico’s Riviera Maya in February 2008). 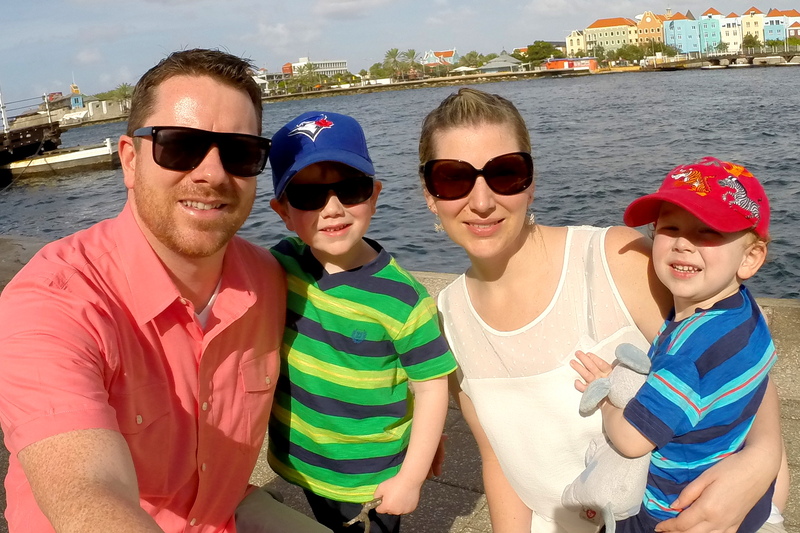 We decided to visit Aruba because we found a great deal on flights by redeeming our Aeroplan Miles. We shared how we found these flights in this blog post. We found 4 round trip flights from Vancouver to Aruba for less than $700 (total). We spent a total of 5 days in Aruba (as well as 3 days in nearby Curacao) and we felt that was enough time to get a feel for this popular Caribbean island. 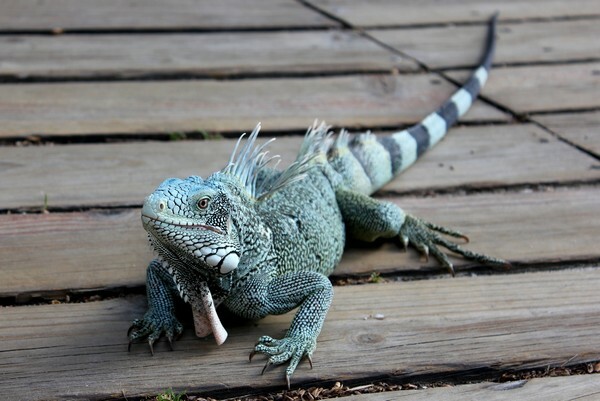 Today, we’d like to share a few of our first impressions and observations from our trip to Aruba. When we say windy, we mean REALLY windy. All the time. Now, that’s not a bad thing. The breeze keeps things cool, especially mid-day when it gets really hot. But you need to make sure you’re prepared for strong gusts of wind. This will be challenging when sitting outside for lunch or dinner (items are easily knocked over or disappear in the wind). Before this trip to Aruba we discovered our youngest boy, Connor, had developed a fear of wind. The minute he felt wind hit his face, he would run back inside crying. Because it’s always windy in Aruba, the moment we stepped out of the airport, and he felt the strong wind hit his face, he immediately freaked out and tried running back inside the airport. 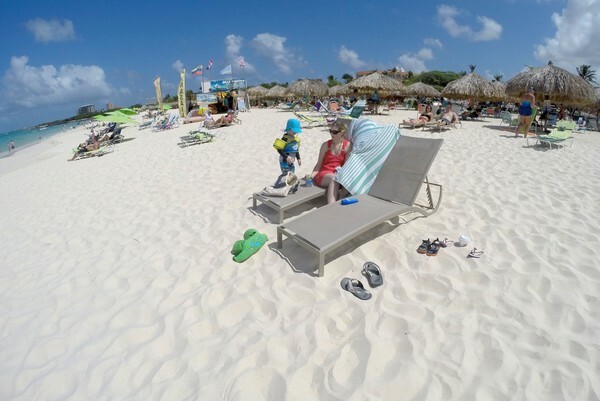 The first few days in Aruba were rough (in the above photo, Connor is actually sitting in his stroller hidden behind that towel), but this trip helped him get over his fear. He is no longer scared of the wind. The beaches in Aruba are some of the nicest beaches we’ve ever witnessed. 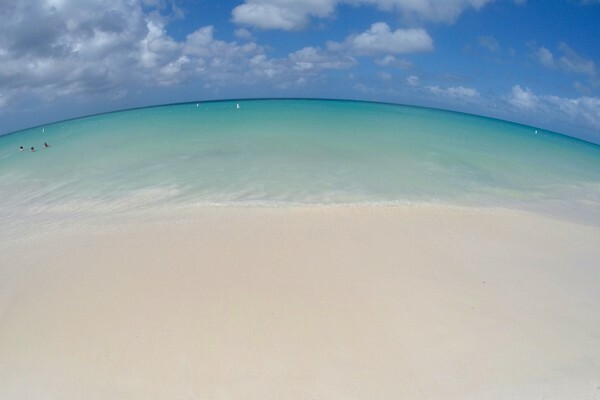 We would easily rank Aruba beaches in our top 5 for most beautiful beaches in the world. Bold statement, but true. Seriously, look at that photo above! That’s Eagle Beach. The silky white sand is incredible. It’s so soft and it doesn’t get too hot on the toes, even during peak sun hours. The bright turquoise water is as beautiful as it looks in the photos. The sunsets on Eagle Beach and Palm Beach are spectacular. Because the beaches are west facing, you’re treated to a soft pastel sunset every evening. Our boys loved running up and down the beach, dancing through the waves. 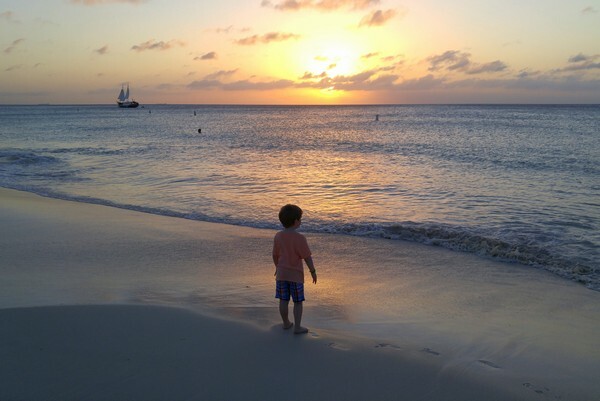 Those sunset evenings on the pristine beaches are what we will remember most about our time in Aruba. 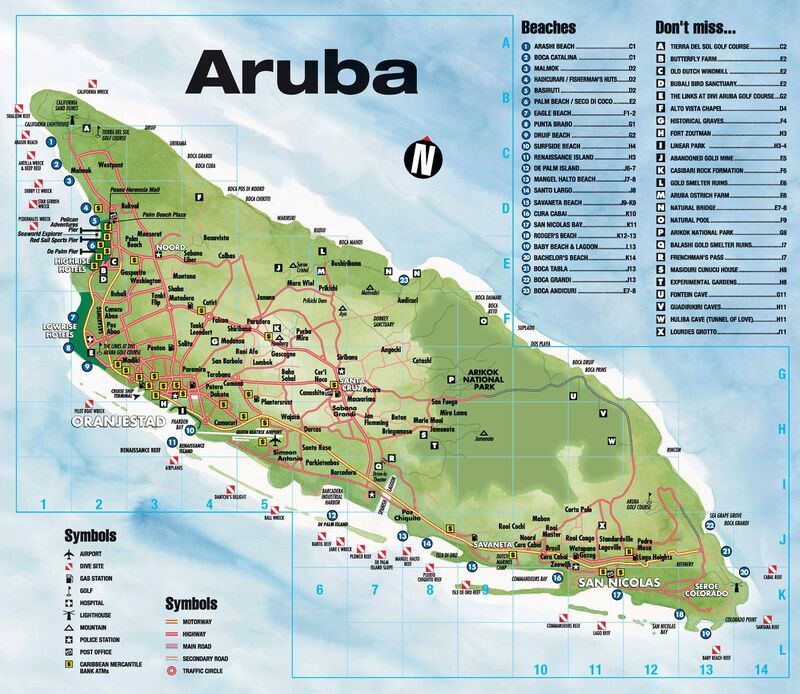 Here’s a map of Aruba beaches and attractions. The average temperature in Aruba is 28 degrees Celsius (82 degrees Fahrenheit), making it the perfect winter escape for us Northerners. What’s interesting is that this average temperature is consistent throughout the year, so there really isn’t a bad time to visit. The temperature range throughout the year is between 26 to 29 degrees Celsius. And even when it’s really hot, the constant wind keeps things cool and breezy. It’s reported that Aruba receives an average of 40 cm (16 inches) of rainfall each year. Yes, that’s for the entire year! This ranks as the lowest amount of rainfall in the Caribbean. 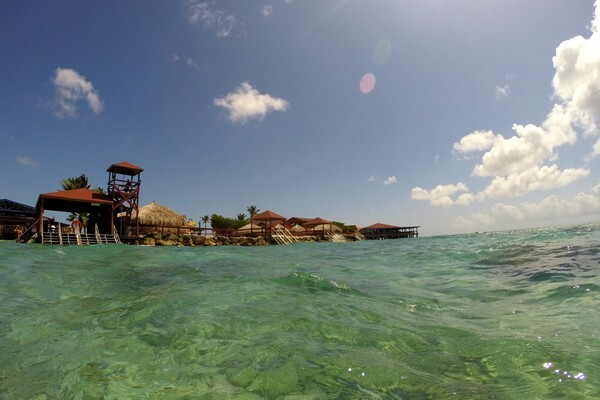 It’s said that Aruba has the most sunny days of any island in the Caribbean. We like those odds! Now, I don’t want to jinx your trip, but those facts all but guarantee your going to experience great weather in Aruba. An added bonus is that Aruba is located outside the hurricane belt, so it’s very rare that a hurricane will hit the island. A desert in the Caribbean? We were surprised to learn that Aruba is often called the desert island. We’ve also heard the island described as “Arizona with beaches”. 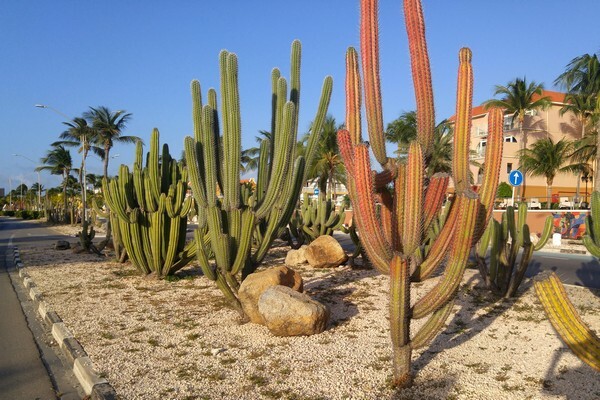 Similar to the deserts of Arizona, Aruba is covered with giant cactus and dusty rocky landscapes. When we learned the island only receives 40 cm of rain each year it all started to make sense. When you move away from the white sand beaches you’ll find diverse landscapes and ecosystems. In fact, almost 20% of Aruba’s land is covered by Arikok National Park, a protected park that boasts a variety of indigenous wildlife, cactus plants and rock formations. Here’s a list of things to do in Arikok National Park. Arikok National Park is located along the southeast coast of Aruba and is only accessible by 4WD. Most visitors will either rent a car or take a guided tour on an ATV or UTV excursion. You can book day tours to Arikok National Park from Oranjestad, the capital city of Aruba. Most tour operators in Aruba will also pick you up at your hotel. We did not rent a car in Aruba but it would have been a good idea. Although it’s a small island (32 kilometers from top to bottom), there’s actually quite a lot of things to do in Aruba. And, it’s not easy to travel around the island without a vehicle. The downtown area is small and walk-able, but getting there and back can be challenging. While the west coast beaches are lined with hotels, they are quite far apart. Walking from one end of the beach to the other will take a lot longer than you think, especially with small children. There is a public transit system that is cheap, but it’s not very convenient and the time schedules are unpredictable. Renting a vehicle will save you time and money, especially if you plan to visit Aruba’s popular tourist attractions. We typically rent vehicles with Sixt Rent a Car. On the other hand; if your plan is to sit on the beach all week, you likely won’t need to rent a vehicle. De Palm Island is an all-inclusive island offering a wide range of food, drinks and activities that caters to both kids and adults. You can choose to sit on the beach and sip frozen cocktails or get active and snorkel from the island shore. The island has a fun water park for the kids, zip-lining, Snuba, private beaches, snorkeling, multiple restaurants and, of course, endless adult beverages. It’s a fun place to turn off the brain and enjoy the Caribbean sun. Aruba is part of the ABC islands (Aruba, Curaçao, and Bonaire), which are the western-most islands of the Leeward Antilles in the Caribbean Sea. All three islands are part of the Kingdom of the Netherlands, although they remain outside the European Union. It felt a little strange to be on a Caribbean island, just a few kilometers north of Venezuela in South America, that has Dutch flags everywhere. We chatted up a taxi driver who shared his thoughts on the relationship between Aruba and the Netherlands. He informed us that Aruba is autonomous and self-governing, but still relies heavily on the Netherlands for many things, like national defense and international interests. We asked him if there are a lot of Dutch residents on the island and he said the number was fairly low when compared to other nationalities. Aruba is said to be one of the most diverse nations in the world, with over 90 nationalities residing on the island. That’s impressive when you consider the island has a total population of 103,000. Aruba is not cheap. It didn’t help that our Canadian dollar is weak right now and we visited during peak season (February). Of course, there are many ways to save money, like renting an apartment that’s located inland and shopping at a grocery store instead of eating at restaurants. But we didn’t travel all the way to Aruba to cook our meals and eat indoors. We use the beer test to measure how expensive a destination is. The average price for beer at a restaurant on Eagle Beach is $5 USD for a 25cl bottle. In Canada, a pint typically costs $7 CAD. You need 2 x 25cl bottles to equal a pint (that’s a US pint, not a UK pint). So, that’s $10 USD for a pint. When you factor in the current exchange rate, that’s about $13.50 CAD for a pint of beer in Aruba. That’s double what we pay in Canada. Not cheap. Many restaurants and bars add a service charge to your bill automatically. It’s important to note that this is not considered gratuity. We challenged a bartender at our hotel about this service charge and he said it is collected to share with service staff, but gratuity of 15-20% is still expected (on top of this service charge). So, you actually end up tipping 30%. We spoke to tourists who frequent Aruba and they told us NOT to tip on top of the service charge. They said it’s a misleading and unethical charge that most bars and restaurants get away with because first time visitors don’t know any better. Consider yourself informed. Aruba is a safe and easy country to visit. We didn’t have any trouble getting around. The people are friendly and accommodating. Most restaurants have a kids menu and there’s a good mix of local restaurants and big North American chains. Aruba is built for tourism, so it’s easy to find tours and activities. Building on the above point, Aruba hotels are not cheap. Especially during the travel peak season from January to March. 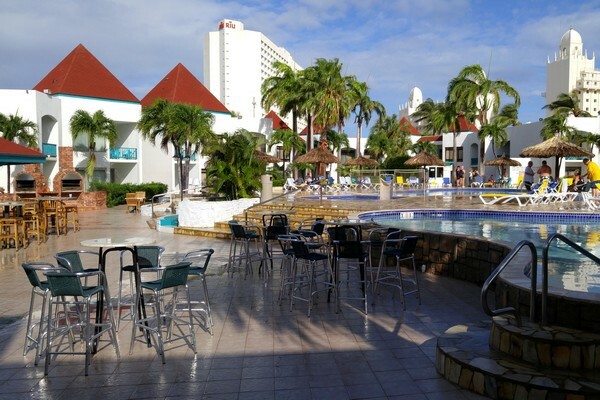 There are all inclusive resorts in Aruba but we found it hard to justify $500 per night. That said, after experiencing how expensive food and drinks are on the island, we probably would have gone for the all inclusive resort option. It would have ended up costing about the same, but the resorts would have been nicer. We spent a few nights at the Tropicana Aruba Resort (Eagle Beach) and one night at the Mill Resort Hotel Aruba (Palm Beach). Both are 3 star hotels that were not located on the beach. We decided to stay at the Tropicana Aruba Resort because it offered a 1 bedroom option. In the past, we’ve opted for 1 bedroom suites because it’s ideal for baby travel. This trip to Aruba taught us we no longer need a 1 bedroom suite because we don’t need to contend with naps anymore (yeah!). The above photo is from the Mill Resort Hotel. 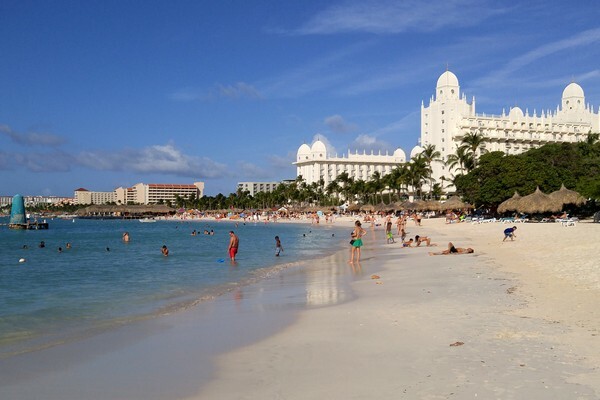 The big white building in the backdrop is the popular Riu Palace Aruba. The hotel sits directly on Palm Beach (see photo below), so you get an idea of where the Mill Resort Hotel is located in relation to the beach. We had to cross a busy road and the beach access was about 1 kilometer from the hotel. Not a big deal, but we have preferred to be on the beach. In our opinion, both the Tropicana Resort and Mill Resort Hotel are dated and overpriced. The pools and grounds are decent, but not great. Our stay was fine, we don’t have any complaints, but we felt like if we paid a little more we would have had a better experience. We recommend you spend a little more and get a nice hotel located directly on the beach. Search for Aruba hotels and resorts here. 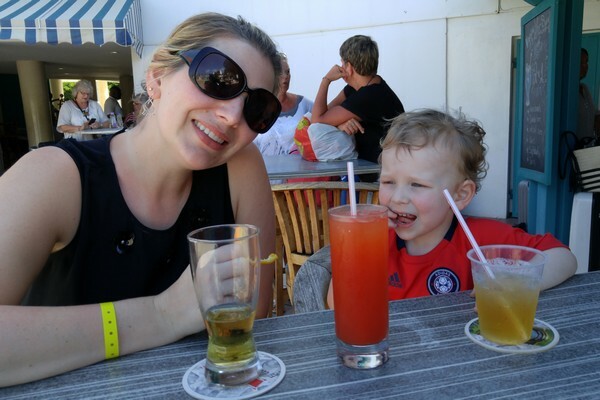 Over the past few years we’ve talked about how our travel style has changed since having kids. We now see the value in paying more for convenience and luxury. We prefer destinations that make it easy for family travel. We are so done with backpacks and hostels. We enjoyed our time in Aruba because it was simple, easy and relaxing. We didn’t want our schedules overwhelmed with activities and attractions. Instead, we wanted to slow down and enjoy the sunsets together with our toes in the sand. Aruba gave us exactly what we were looking for. I loved reading your story! We live in the Toronto area now but lived in Calgary for over 6 years. I would love to see anything about how and what miles you collect – Air Miles, Aeroplan and Avion are what we collect. A lot of blogs talk about U.S. sign up bonuses and credit cards. Wish we had as lucrative miles as they do!! We did our first family cruise last month. Our kids are older but there were many small children aboard! Hi Karen – I hadn’t thought about sharing our tips for collecting/redeeming miles in Canada, but you’ve planted a seed. The big strategy we have is that we share one account instead of each having separate accounts. We use our credit card to pay for everything, especially gas and groceries (double the points). Right now we use the CIBC Aventura but we will switch soon. Likely moving to the TD Aeroplan. Every few years we switch banks to get the welcome bonuses. We also have AAdvantage Miles for the US. Thanks for the insight on Aruba. It seems all inclusive is the way to go for many islands with our weak CDN $ these days! For what it’s worth 4 adults and a child shared a fantastic homeaway.com home with a private pool. We bought groceries at a nearby store and we found it to be a very affordable option. We didn’t rent a car and found taxis to be quite reasonable. Was the wind terrible that it was annoying to sit on the beach ? No – it is not that bad. But it is windy, so come prepared. What does come prepared mean as far as the wind is concerned? Going in June, first visit…. Just know that it will be windy. Prepare your mind so that it’s not a surprise. When you eat outside, strong gusts will come out of no where, so have your loose items secure or in a bag. I also stayed at the Tropicana Resort. Im so happy I chose a hotel close to Eagle Beach, such a beautiful beach. Loved your beer test to judge whether or not a place is expensive or not. Any suggestion on a Carribeen area that may not be as expensive or other suggestions travelling Canuck. Thanks for sharing this great info! 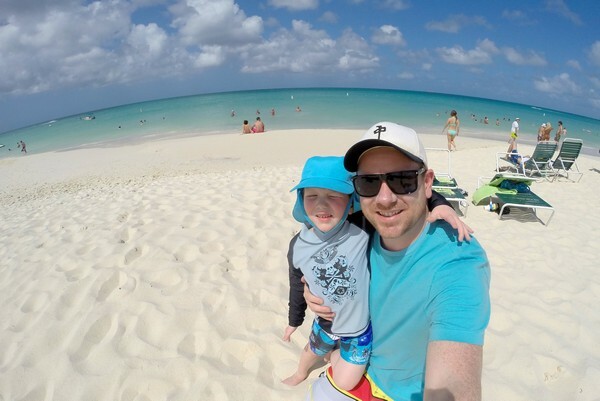 We are traveling to Aruba for the first time in a couple weeks with our 3 year old and 4 month old (I know, we’re brave souls haha). I have a couple questions for you guys: I’ve heard you need to arrive at the airport in Oranjestaad several hours before your flight home, is this true from your experience? And is there US customs at the airport there? Asking because we are flying through Chicago on our way back to Vancouver and the connection time is really tight.